You may already have heard of this lil' space western; it's gotten quite a bit of free press lately. 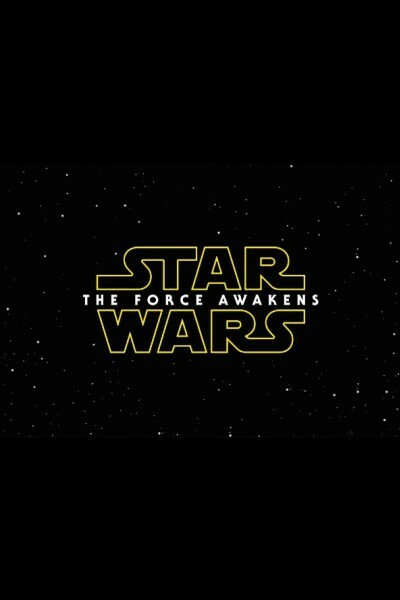 It's called Star Wars, and is only the most highly anticipated movie in 38 years. I love watching the box office receipts roll in at $100 million per day. That's crazy—or not—depending on your point of view. It's unnecessary to say much more, as doing so would be akin to remarking, "Hey, have you heard of the sun? Lemme wax on about it." Seems very nose-on-face. When that Lucasfilm Ltd. logo appears, followed by the words "A long time ago in a galaxy far, far away," then that classic tilted crawl, then John Williams' jubilant score, well, you just might weep a little. In fact, I was personally so anxious at the theater before the film began that I had a teensy weensy tummy ache. The kid in me was that excited...that hopeful...that nervous. "Gosh, let this be good," I chanted. To see George Lucas' baby all grown up—to know how much it has meant to him and how it has consumed and transformed his life—is an emotional thing. It's nice to see a quiet and peaceful person succeed, and I couldn't be any happier for him as both an artist and a fellow human being. He had a number of shaky starts four decades ago, and Star Wars was light years beyond the now-AFI-fave American Graffiti (which was phenomenal, duh, but also modest and filmed in just 29 days around town), so Lucas' longevity is a testament to his creativity and stick-to-it-iveness and, well, genius. He is a fortunate person who, from THX to Skywalker Ranch, has impacted the craft of filmmaking for all time. I immediately purchased Han's heavy blaster pistol, Luke's lightsaber, a tiny brown landspeeder with springy wheels, and as many 5" tall action figures as I could possibly get my hands on. I kept nothing in pristine boxes; to the contrary, everything got sweaty and grimy and dirty really fast, and I vividly remember tying green floss around the scrawny stormtroopers' necks, throwing them out my second-story bedroom window over adjacent tree limbs, and shooting their arms and legs off with my scoped Crosman pump-action pellet gun. And those times come flooding back in the first ten minutes of The Force Awakens. The flick is old school and does a beautiful job bringing our beloved characters back together while positioning appropriate hand-offs for the next generation. It's sufficiently gritty and nostalgic and, despite lots of opportunities to over-CGI things, remains 'dirty space' and hyper-real. I love that charming approach to filmmaking, where actual sets are hammered and great costumes are sewn in order to transport us to a different place and time. Despite its obvious resources, The Force Awakens avoids the trap of over-ornamenting the Christmas tree. We saw the film as a company, spouses and kids included, and everyone seemed to enjoy it. Where there are nits, and sure, there are a few, they revolve mainly around déjà vu, as in, "Hmm, I think I've seen this film before." It is rather New Hope. Alas, I'd still probably score it a very strong 7.5 or 8, and I have every confidence that Episode VIII might achieve an 8 or 9, particularly now that some old business has been resolved and we're off to a fresher, cleaner, less encumbered start. There was a lot of admitted baggage accompanying the last three installments that needed to be ditched, so I view The Force Awakens as a palate cleanser and a pivot. Excitingly, The Force Awakens is also diverse, and I love that its central protagonist is female. Daisy Ridley is adorable, and though I don't think she'll be on anyone's Oscar radar, she's scrappy, spunky, strong, and fun. She and the entire cast appear to be having a rollicking good time, and J.J. Abrams has succeeded markedly at infusing the franchise with the characteristically wry wit, dry humor, and repartee that was so common in the originals, particularly between Han and Chewie. I needn't say more; your going or having gone is a foregone conclusion, as is the addition of BB-8 to your Christmas list. My larger hope is that, whether you are 8 or 80, The Force Awakens will be for you what the original was for me and millions more: a lifelong memory, not a movie.